We use the term freely, perhaps carelessly, and almost never in a quantifiable way, but the simple label implies immediacy, intrinsic danger and even the possibility of irreversible change to our rivers, streams or fishing expectations. Let us examine the meaning of last week’s flash flood in the upper reaches of the South Branch of the Root River in southeastern Minnesota. The National Weather Service at La Crosse, Wisconsin, operates a weather radar surveillance of the region stretching over a radius of approximately 300 miles. The image below is a summary of rainfall totals from the thunderstorm line that crossed over the Root River watershed on June 9, 2018. Dead center in the image is the border junction of Minnesota, Iowa and Wisconsin. 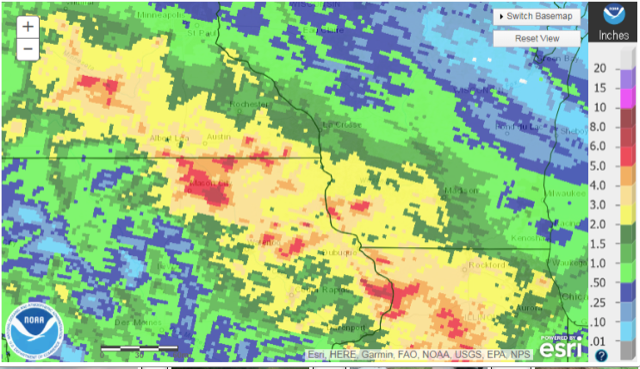 The storm moved west to east along the Minnesota/Iowa border, dropping precipitation totals ranging from 3 inches (color-coded as light yellow) to 6 inches (dark red) over a period of less than 24 hours. The northern reaches of the Root River (North Branch and Middle Branch) received up to 3 inches of rainfall, whereas the South Branch Root River and upper Iowa rivers received 6 inches or more during the storm. The result of this rainfall in terms of the flow rate (discharge measured in Cubic Feet per Second—CFS) of the South Branch of the Root River is recorded in the hydrograph (below) at Carimona, 6 miles upriver from Preston, Minnesota. From the beginning of June, 2018, until the 8th, river discharge at Carimona (blue line in the figure) was a leisurely 50-60 CFS, a flow rate typical of early summer. Within 12 hours of the storm’s passage, river discharge had spiked at over 5500 CFS, a 100-fold increase in stream flow. Mercifully, the peak discharge diminished quickly, but 3 days after the storm, stream flows were still over 700 CFS, a flow rate that kept sediment particles suspended in the water column so that clarity of the water was still less than 30 cm. At this level of transparency, trout fishing would be productive only with natural baits. If no further storms occur during the next few days, fishing will again be possible with lures and flies by the weekend of June 16-17. The most dramatic flash flood in recent times in our region occurred from August 18-20, 2007, when the Rush Creek watershed, tributary to the Root River, received over 17 inches of rainfall over the weekend. (https://www.weather.gov/arx/aug1907) We can be grateful that last weekend’s thunderstorms were merely a hint of what can happen to our fragile surface waters throughout the driftless area.